UCMC publishes an abridged version of the Novoye Vremya article. Quote-myth: “No document can prove that the UPA fought against the Germans. The Germans supplied the UPA units with weapons in 1942, 1943 and 1944,” stated Dmytro Tabachnyk, Ukrainian Minister of Education and Science (2010-2014). The UPA was created by the Nazis. They closely cooperated in undertaking punitive operations against Soviet partisans, Ukrainian, Jewish and Polish population. There is no evidence of the UPA’s anti-Nazi fighting. Extremely brutal occupation policies of the Nazis forced the OUN (b) Provid (the governing body of the organization) to take up arms and defend the population. The first UPA hundred (military unit) was formed on January 22, 1943. And on February 7 it already defeated the German commandant’s office in the district center Volodymyrets, Rivne region. In the spring of 1943, the UPA constantly increases the extent of resistance. Their fiercest clashes with the Germans happened near Lutsk, Kovel, Horokhiv, Rivne, Kremenets, Kostopil, Sarny and Lanivtsi. During March 1943, the insurgents seized regional centers five times. At the end of the first spring month, the German officials reported to Reichskommissar Erich Koch that only two areas in Volyn were free of “gangs”. The occupation administration began undertaking extensive anti-partisan operations involving armor and aircraft. At the end of April, a division for fighting the UPA was redeployed to Berezne, Lyudvypil, Mizoch, Ostroh, Shumsk, and Kremenets. The Nazis counterinsurgency actions proved to have little effect. While in March the UPA units attacked the German economic targets only 8 times, in April there were already 57 attacks, and 70 in May. Heinrich Schoene, General Commissar of Volyn-Podillya, reported at a meeting in Rivne June 5, 1943 to Reich Minister for the Occupied Eastern Territories Alfred Rosenberg that “Ukrainian nationalists cause more difficulties than the Bolshevik gangs” to his administration. The available Nazi forces were not enough to suppress resistance. Therefore, Erich von dem Bach, commander of anti-partisan forces in the East, took the struggle against the UPA in his hands in July 1943. He commanded the 8th SS Cavalry Division Florian Geyer (10,000 soldiers) and 10 mechanized infantry battalions with artillery. The grouping was covered by 27 aircraft from the air and 50 tanks and armored vehicles on the ground. However, UPA units maneuvered and gave the enemy no chance to destroy them. Overall, in July the insurgents attacked German bases 295 times, and maintenance building 119 times. In early August 1943, von dem Bach was sent to another area. The German pressure weakened, and the UPA intensified their anti-German operations: 391 assaults on garrisons and 151 attacks on enterprises. But soon, Hans-Adolf Prützmann, Higher SS and Ukrainian Police Leader, organized a new attack on the UPA. This attack lasted from August 23 to September 9, 1943 in South Volyn. First, aircraft bombed the village of Antonivtsi, which was the headquarters of the Bohun group. Then the punitive expedition attacked the UPA camp in Kremenets forests. The Kurins (battalions) had to split into small units and break out of the encirclement. In the summer of 1943 the insurgency anti-Nazi movement spread over Halychyna. On August 18, Ukrainian People’s Self-Defense (UNS, the original name of UPA in Halychyna) attacked the German stone quarry in Skole, Lviv region. The nationalists freed 150 forced laborers and killed the camp security guards. Autumn 1943 was the beginning of larger scale battles between the insurgents and the Nazis. On September 3, Ukrainian soldiers on commanding eminence executed a German battalion that was travelling by narrow-gauge rail in the mountains near the town of Dolyna. The invaders left about 200 soldiers on the battlefield. On September 25-29, the Trembita hundred repelled a punitive attack on their camp on Mount Stovba. On November 29-30, 1943, there was heavy fighting between 1.5-2 thousand Schutzmanns and the Kryvonis-II Kurin near the village of Nedilna, Sambir district. The insurgents retreated with considerable losses, almost the entire headquarters and the leader of the Kurin were killed on the battlefield. Prützmann undertook the last major counterinsurgency action in Volyn in November 1943. On November 2-3, aircraft bombed the town of Stepan and ousted the units of Zahrava group to the north. Simultaneously, on November 3 German planes bombed and shelled the town of Kolky, where the UPA had formed the Kolky Republic. It should be noted that the Nazis could not seize the Republic from June to early November 1943, and then they carried out a clearance operation, killing 600 civilians. In October-November 1943, the UPA-ONS conducted 47 fights against German occupiers, and the UPA village self-defense clashed with them 125 times. The Nazis lost more than 1,500 soldiers. 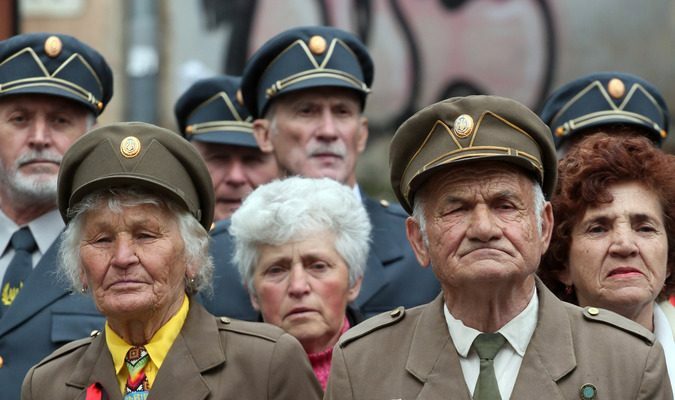 The Nazis failed to suppress the UPA resistance completely. The approaching Soviet-German front drained most part of military forces. Therefore, the German generals stopped undertaking actions against insurgents in Volyn. In Halychyna, the confrontation lasted until the end of summer 1944. Ukrainian People’s Self Defense (UNS) was re-formed into the UPA-West. In March-May 1944, the UPA defended Ukrainian villages against looting by the Germans. In May, the Wehrmacht defeated the Halaida and Siromantsi hundreds in Lviv region. From May 31 to June 6, 1944, the units of the Wehrmacht’s 7th Armored Division fought against the UPA in the Chornyi Lis village. By mid-summer the confrontation in Halychyna peaked. The biggest clashes of the UPA-West with the German-Hungarian troops took place around Mount Lopata on the boundary between Drohobych and Stanislav (now – Ivano-Frankivsk) regions. These events were also detailed in written reports of the Polish underground. From July 6 through July 16, 1944, heavy fighting took place – both with artillery engagement and close-handed fights. Insurgents under Vasyl Andrusyak’s command won. Fifty Ukrainians were killed. The invaders lost 200 soldiers and retreated. Under pressure of the Red Army the Wehrmacht left Ukraine. The UPA continued to skirmish and disarm German units until early September. There were episodes in the history of the Ukrainian insurgency movement when some commanders tried to illegally negotiate with the German command using the formula “neutrality in exchange for weapons” or “food in exchange for weapons.” Besides, several cases are known when from 80 to 100 small arms were handed over to the insurgents using the above formula. But the Ukrainian underground leadership did not welcome such arrangements. In some cases, it even led to severe punishment. In March 1944, the UPA field court martial sentenced Porphyriy Antoniuk, the first initiator of the unauthorized negotiations, to death. In April 1944, Mykola Oliynyk was sentenced to death by the UPA court. However, the talks with the German occupation officials were subsequently held by the OUN (b) Provid. The occupiers wanted the OUN and UPA to stop fighting against them so that the Germans could focus on repelling the Soviet Army’s advance. The OUN members sought to secure the release of prisoners of concentration camps (Stepan Bandera, Yaroslav Stetsko and many others) as well as to obtain weapons, which they always lacked. Meetings between the Provid members and German authorities took place in March, April, June and July 1944. As a result of them, the insurgents received several hundred units of weapons, and in September – October 1944 Bandera and other Ukrainian nationalists were released, though they remained under the Gestapo supervision. According to researchers, 12 thousand German invaders and their allies were killed by UPA members. The Ukrainian underground and insurgent units also lost 10-12 thousand people during the armed confrontation with the occupiers.